This is the first in a series of videos documenting the design and evolution of a live performance rig for modular synthesizers. I've been working with Eurorack for the last couple of years in a studio setting, and have learned over time what modules and types of modules I like and don't like. I decided over a year ago to migrate much of my system to a portable case suitable for live performance, as well as bringing to other recording studios. This series will show my thought process, and will look at each sub system, and how they work together as a whole to make a improvisation-oriented live performance system in Eurorack. This looks excellent! can't wait to see more. Just make sure to not use https:// links, but just http:// and everything should be fine (same not only goes for videos, but also for SoundCloud links etc.). You have a good voice for these types of videos and there’s something about a man of mature age sittning in shorts on the floor unboxing a new toy. Looking forward to the videos about the actual live oriented modular setup. Thanks for that, Lisa. I was born with a radio voice, which comes in very useful at my day job, where we record dialog all day long. Of course shorts! I live in Southern California - what else would I wear? My typical uniform is a black t-shirt, shorts, and a pair of Teva sandals. On a more interesting note, I am in the middle of writing the script for the next episode, which is on the large-scale design and layout of the instrument. Part 4 will then be on the master clock and pulse streams. That will be the episode where we get away from the abstractions and large-scale thinking, and get into the detail of how the modules work together. That will be the episode where we get away from the abstractions and large-scale thinking, and get into the detail of how the modules work together. I will be following this series intently - mana from heaven. This one is all about design and layout, breaking down the modular into systems that interact with each other. And there is a bit on the amazing Steevio, who's ideas for polyrhythm, harmony, signal routing, and groove within a modular system are highly influential on my design. There's a ton of analysis and theory that I wanted to get through. Next time we get into the actual modules. Nice! 8 voices though, that's a lot to keep track on in a live situation. You talk about the ADSRs, have you thought about the Intellijel Quadra? It can do quad AR. AHR. and Cycle! They go down to some nice and snappy timings aswell. How are you approaching stereo out to the mixer? do you just do 2 mono imputs and pan them left and right or do you have to merge the mono eurorack cables into a stereo trs? Lisa: You are absolutely right - 8 tracks is too much to keep track of at once. But the plan is not to be using more than a few at a time - and if it turns out to be too many voices, either for space or practical reasons, then I will pare down for sure. Blacklight: Thanks for the tip on the Quadra. I love Intellijel stuff, so I will definitely check it out. As far as the mixer, I plan on having each voice out to the mixer as a separate line. That way, I will have control over level, pan, reverb amount, etc. I mention my current thought in the video, which is to use the 1U Link modules to connect the modular to the mixer via DB25->TRS cables. We shall see! If I were planning a 12U for a rhythm-oriented live rig (I suppose that's what you're doing, right? ), I'd rather have my stereo mixer within the case, especially with the amount of voice you're aiming for. Of course it eats up a lot of "valuable" space, but having everything inside the rack is very appealing, at least to me. The WMD performance mixer would give you control over level, pan, aux send/return return, headphones out etc. hi Nick, nicely produced video series! Something I did that you might also want to consider for your live case is to modify and combine a Doepfer A-182-1 switched multiple and a regular passive multiple. Thanks so much for the compliment. I completed writing part 4 last week, and was going to try to finish it this weekend, but the Plaits video I just did that was supposed to be a quick listening session turned into an hour-long extravaganza. So next week I should have part 4 up. Your idea is so great. I went to your post and studied what you did for about 10 minutes before it finally clicked. Turns an 8-in, 2-out box into 4 2-in, 2-out boxes. Makes much better use of the space if you don't want to have every possible input go to each voice. I really like it, and will think carefully about how I can incorporate it into the signal routing for my rig. Thank you so much for sharing. Yes, I know. Cost is always an issue. I currently try to transform my 6U/104HP without mixing and effects into a fully-contained 7U/104HP incl. sub-mixing/mixing and effects. Talking about limited space and hard decisions..
Just found this thread and watched the first video. Just wanted to say: great, well thought out presentation on a very interesting topic. Looking forward to watching the rest - great work! Just watched the second video. One aspect that you didn't discuss (presumably as it wasn't a high priority?) was the ergonomics. When I started building my eurorack system, I went for the portable Doepfer cases, which I have since expanded to two a-100 P9 and a a-100 base case. So similar form to the low cost cases you have on your studio set up. 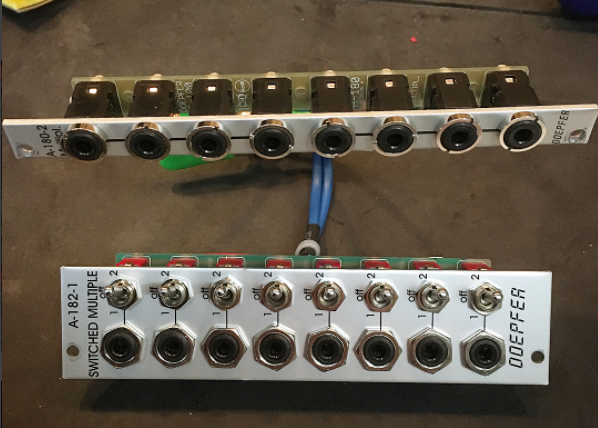 A friend of mine started in eurorack and built his own case, which looks a very similar design to the one you purchased. I have to say the ability to have the top case at a slanted angle rather than simply vertical for me looks to be a massive benefit. I find the Doepfer top cases a little uncomfortable/ feel cramped to use without being angled, perhaps my solution would be to have them on a higher table top, but I'm currently limited in where I can locate them in my office. Looks to me the case you bought is an excellent choice and very well built. Congratulations on the purchase. Looking forward to the rest of the videos. I'm happy to say that episode 4 has just been posted! In order to explain clocks, I ended up doing an overview of rhythm and rhythmic nomenclature, including stuff like polyrhythms, swing, compound time signatures, etc. But hopefully it is worth the slog. At the end, I demonstrate every single aspect of my clocking system, including a manual swing circuit, buffered mults to distribute pulses cleanly, and having access to every subdivision from 64th notes to 64 measures in length.